Vedic astrology differs from modern western astrology in many ways. There are 2 styles of Vedic chart wheels, the North Indian and South Indian style, and both of these styles are different from the traditional western style round wheel. Planetary strengths are calculated using complex formulae, and there are 20 "divisional charts" or "vargas" that are used. The planets Uranus, Neptune, and Pluto are not included. All of these basics of Vedic astrology are included. The 12 zodiac signs are very familiar to most of us, and many people know their Sun Sign. In India a different system of celestial signs has also been used. It is a system of 27 signs and each sign has a length of 13 degrees and 20 minutes, rather than 12 signs of 30 degrees each. 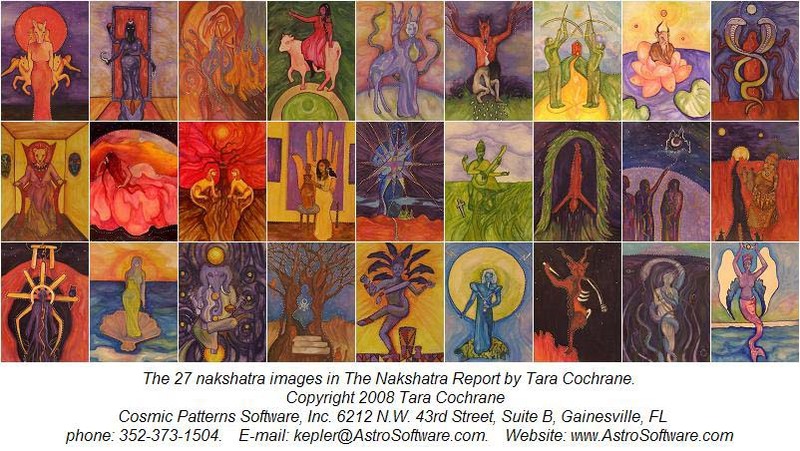 These 27 signs are known as "nakshatras". Nakshatras are widely used by Indian astrologers to provide vitally important information. For example, nakshatras are used for determining compatibility in marriage and the naming of children. In this report astrologer and artist Tara Cochrane paints a picture of your relationship to the cosmos. The nakshatra image combines with the descriptive information to provide you a window into the deep wisdom of ancient India. This report is designed to shed light on your individual nature and soul's purpose.